The Classic Car Gallery is proud to offer this stunning Ferrari F360 Spider Fiorano F1. Finished in NERO BLACK over black leather and a black top this car makes a stunning sportscar statement!! The Nero paint shines with a deep luster and is in near showroom condition. The Black leather interior is in excellent condition with minimal wear. The black canvas top is in excellent condition, the rear window is clear and blemish free and the electric top mechanism works as it should (Top has just been serviced). The stock Ferrari F360 five spoke wheels are shod BF Goodrich G-Force Sport tires have less than 2000 miles on them. It has been adult owned, well maintained and never driven seen rain or snow. The car has a $5000 Tubi sport Exhaust system, and makes a great sound!! The service booklet shows two maintenance services: Belt service (Auto Works Unlimited 03/24/2016 Full service (Auto Works Unlimited) 03/24/2016 New F1 Pump, New Relay, New Accumulator 09/07/2016 Coil Packs and plugs (02/20/2018) Up to date with all service All tools, manuals Ferrari car cover This is a stunning no excuses car that is both mechanically and cosmetically excellent. She has been well serviced and needs nothing except an enthusiastic new owner. 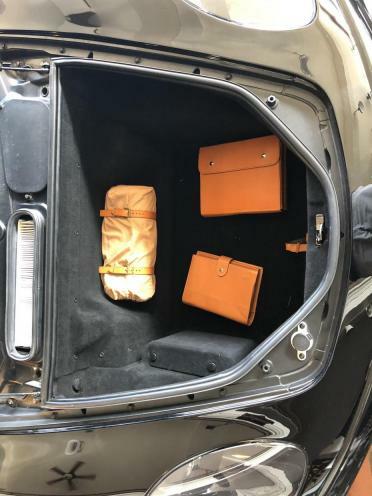 The car comes with all books, tools and service records.